The Metroidvania genre has been around for a very long time at this point—albeit, not long enough for us to work up a less awkward name for it just yet—allowing for a truly varied number of ways for players to make their way around gigantic 2D maps, steadily grow stronger from new collectibles, and finally find that elusive goddamn double-jump upgrade at last. Nintendo’s Switch platform plays host to some of the best instances of the “Oh dang, I still have 23 percent of this map to complete” genre in recent memory, most notably Team Cherry’s Hollow Knight, which manages to combine beautiful, somber graphics, an adorable insectoid hero, and razor-sharp hopping-and-slashing action into one of the best experiences available on the plucky little platform. Now it’s getting some welcome competition, with 2016’s fantastic Momodora: Reverie Under The Moonlight arriving on the system today. Given that Momodora—the fourth game in its series, but the first to go full Symphony Of The Night with its design—has been a highlight of the PC indie scene for going on three years now (and on PS4 and XBox One for two), it’s worth taking a minute here to highlight the ways Bombservice’s game works so well, and the treasures specifically waiting for veterans of Hallownest’s buggy depths. As in HK, the game drops you into the shoes of an adorable hero with an unlikely weapon; in this case, the priestess Kaho, venturing into a cursed city with nothing but a magic leaf (and, to be fair, a surprisingly powerful bow) in order to figure out why the undead burg is radiating malevolence and evil into the surrounding countryside. It’s apparent from the opening moments that the game is very pretty, with lushly drawn, 16-bit style backgrounds and lovingly applied animations. 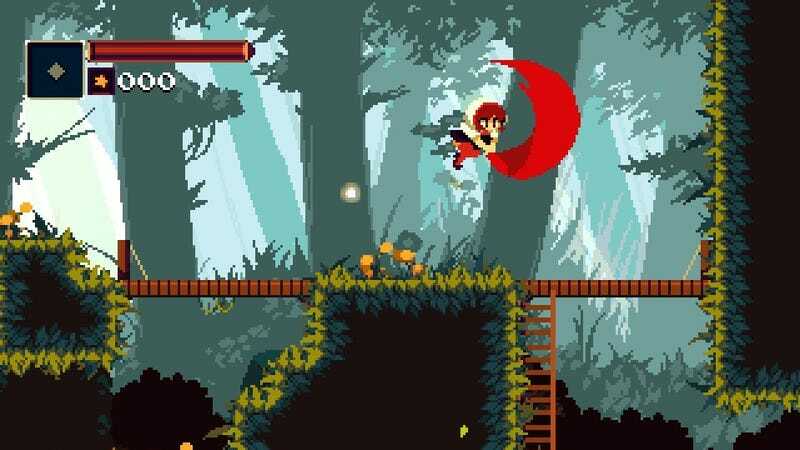 But also, there are a lot of very pretty retro-style games on the market at this point; Momodora distinguishes itself with two elements it lifts liberally from the Dark Souls franchise: a commitment to melancholy as an overall tone, and a combat system that prizes thoughtful risks and well-honed reflexes in roughly equal part. Also, you can turn yourself into an adorable, agile cat. It’s in that willingness to ride that line between “cute” and “Oh, god, everyone is dead” that Momodora finds its greatest strengths. The game is masterful at punching you in the gut mid-“Awww!” It’s not as massive as Hollow Knight, admittedly, but if you’re looking for another bittersweet experience that will also scratch your “jumping around a giant abandoned city filled with insane monsters that used to be people” itch, you could definitely do far worse.